QuickBurst 30 AWG Nickel Chromium 80 resistance wire sells for $.25 per foot. 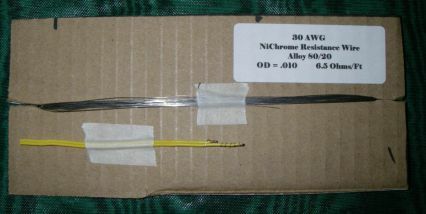 The 30 AWG Nickel Chromium 80 Resistance Wire is used to make 12 volt ground use igniters. Nickel Chromium 80 alloy is 80% Nickel and 20% Chromium. Resistance is 6.5 ohms per foot and measures .010″ OD. 30 gauge NiChrome is the best choice for single motor igniters, it is not the best choice for Clustering or Airstarting. This is the resistance wire only, lead wire and igniter dip is not included. Be sure to order QuickDip.